While Canada has always had a soft spot for Toronto-born rapper Drake, he completely stole our hearts after dropping the music video for his latest track “God’s Plan”. In the video, Drizzy can be seen signing cheques and handing out stacks of cash to unsuspecting strangers in the Miami community costing the OVO frontman close to $1 million USD. Not only did his video go completely viral, it inspired others to give back, including American funnyman Jimmy Kimmel. Last night Jimmy Kimmel revealed his team’s remake of Drake’s “God’s Plan” starring the host’s hilarious sidekick Guillermo. Guillermo had a much smaller budget than Drake but his valiant attempt at replicating Drake’s video is admirable nonetheless. 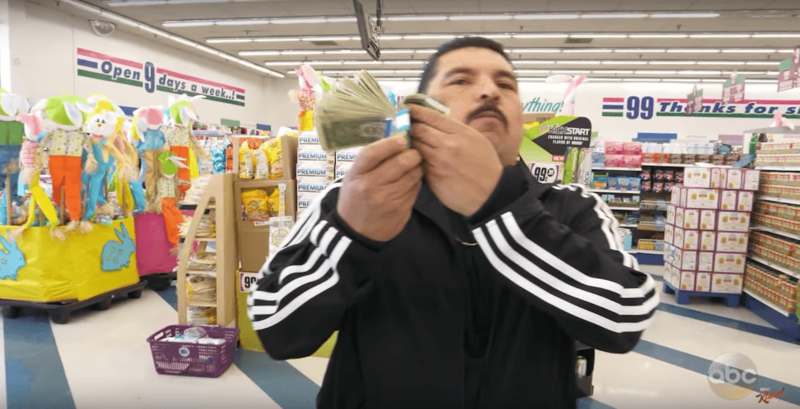 The video shows Guillermo visiting a 99-cent store, where he informs shoppers he’ll pay for one of their items, but no pineapples since they’re $1.99 USD. He can then be seen making it rain on unsuspecting shoppers, and giving a massive $96 cheque to one of the store’s cashiers. We won’t spoil any more of the video, just hit the play button below and enjoy.